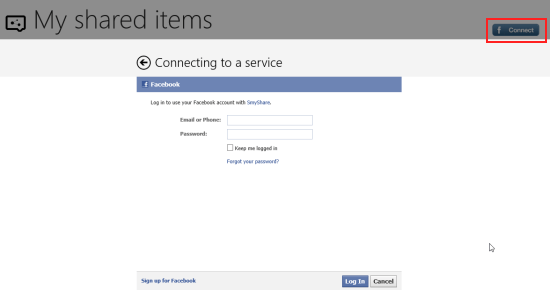 SmyShare is an advance Windows 8 app for sharing on Facebook. This free sharing on Facebook Windows 8 app allows you to share content in a very convenient manner. Here, you are delivered the option to share using the app itself or by using Windows Charm. On launching SmyShare app for the first time, you will be provided a blank screen with Facebook login button placed on the top-right section of the interface. For getting started with SmyShare, you will require clicking on the button after which you will be provided with the form for entering your Facebook credentials. Now, enter account details and click on ‘log in’ button. Then, you will be prompted for authorizing the app to access your information and provide it with extended permission to post on your behalf. Once, you are done with that you can now begin with sharing stuff online. Click on the large ‘+’ button placed on the home screen (after Login). Then, you will require selecting an image file on your PC for sharing it on Facebook. Next, you will be redirected back to the home screen with share-panel to the right section of interface. Finally, add a short description and click on ‘Share’ button and soon the file will be shared online. * The app maintains the history of the stuff shared by you. You can visit the app anytime and access the list from the home screen. In case, you are on some other application then you can use the Charms bar for sharing the application. It must be noted that all applications don’t support sharing. If the current app supports sharing of Photos, videos, links, and text then move the mouse pointer to the top-left section and then select SmyShare. * The shared image files can be accessed inside ‘SmyShare Photos’ album on your Facebook account. Also, check out our posts on Instagram Client Apps, and Facebook Lite. 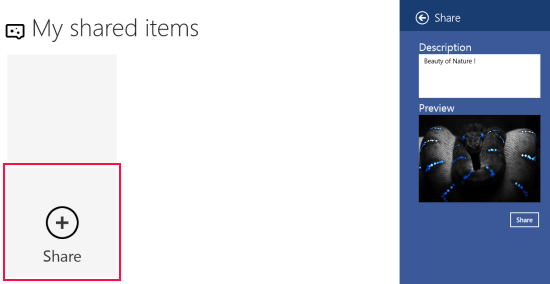 To install Facebook sharing app for Windows 8 on your machine you will require opening this link in browser compatible with Windows Store. SmyShare Facebook sharing app for Windows 8 is indeed a nice option for you to try. The application seems to have some issues with video sharing. 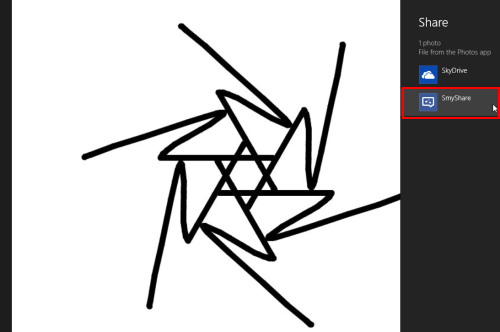 Rest of the functionalities are working fine.